In one of those private things that’s probably not supposed to be common knowledge, Smith said that he and Rozon are working on a Doc Holliday comic and they ended up on a Facetime call while Rozon was in the shower. He requested that maybe he can co-write a comic with Scrofano on the same contingency. Ah, Comic-Con panels, the stories you hear. You can totally tell how much the panel guests got along. The best parts of NYCC are listening to the off the cuff in-jokes between cast and crew mates. Melanie Scrofano and Tim Rozon were really funny together. And good news to fans, as they were signed on for 10-episode second season and Andras broke the news to them that it was expanded to 12 episodes. 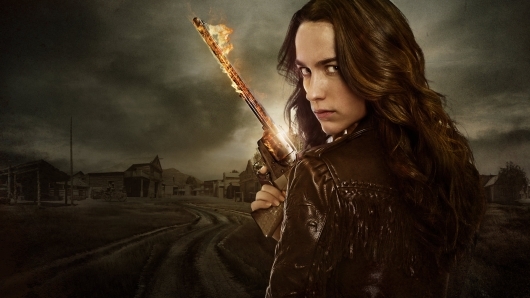 Wynonna Earp returns to SyFy in 2017. You can catch the gang from Wynonna Earp at Barnes & Nobles in Tribeca (97 Warren Street, New York, NY, 10007) on Saturday, October 08, 2016 2PM EST. There will be a panel discussion followed by a signing of Beau Smith’s IDW comic Wynonna Earp Volume 1: Homecoming. You must purchase the graphic novel to get the wristband for the signing. Wynonna Earp Season 1 is available for streaming through on Amazon Video.